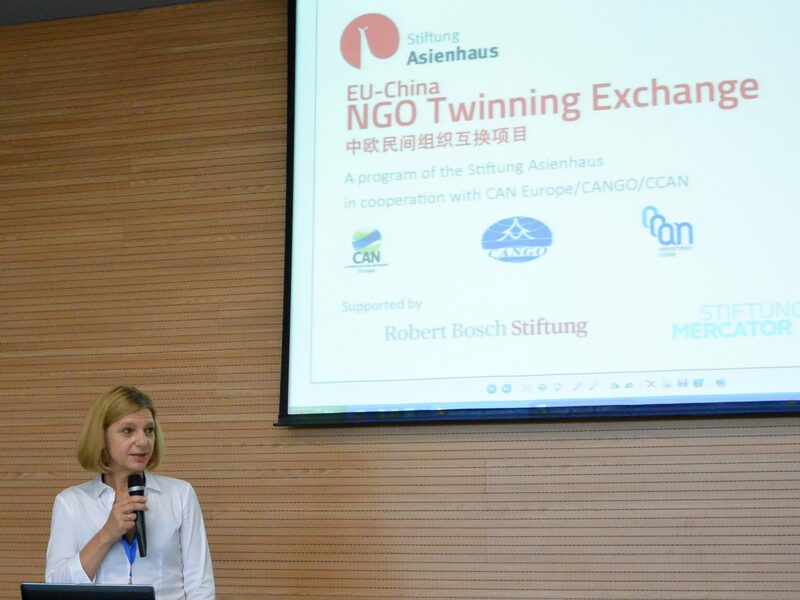 Providing the participating organizations with information on environmental and social topics in the respective other region is one of the main goals of the EU-China NGO Twinning. After a joint welcome session, the two groups departed for separate input sessions on their respective topical foci. 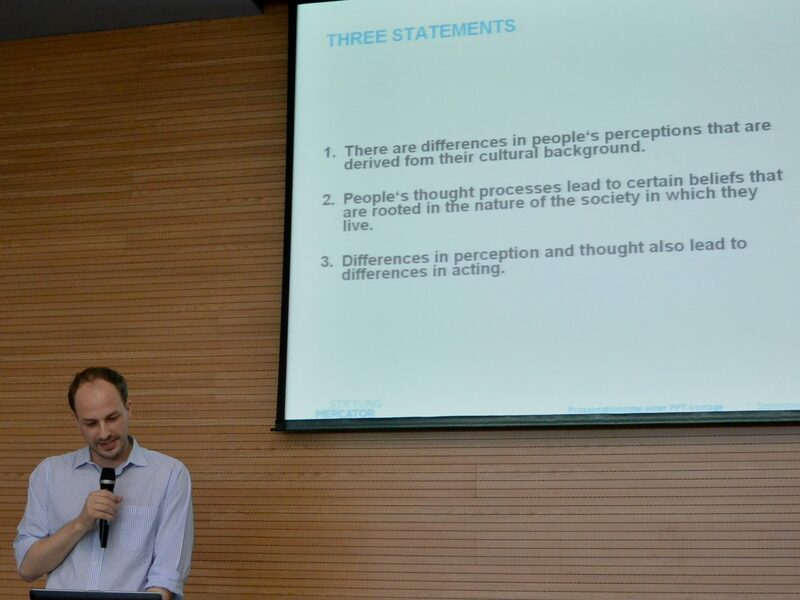 Following welcome speeches by Stiftung Asienhaus’ China program director Dr. Nora Sausmikat and Mr. Huang Haoming from CANGO, the Twinners were provided with an input on the backgrounds on intercultural differences by Caspar Wellbergen from Stiftung Mercator. Presenting the results of a social study by Richard Nisbett, Mr. Wellbergen pointed out that differences in perception are culturally informed. The societies in which we live inform our world view, and the culturally tainted perceptions influence our thoughts and action. According to the study, people in Asia can be characterized by a more cyclic or holistic thinking, arranging subjects more systemic according to their relation to each other. Action takes place with a rather particularistic approach, keeping in mind the interpersonal relations and contexts involved. Westerners in contrast arrange subject along categories and prefer individual action with a wish to show exceptionality. They achieved instead of subscribed status and believe in universally valid rules regarding their action. However, one major takeaway of the presentation was the importance of being conscious of the own preferences and consider them in the own acting and communication. The topical input session on Social and Environmental Justice started off with a presentation by Mr. Tom Bannister (China Development Brief). He gave an introduction on historical developments within Chinese civil society, as they became apparent in CDB’s research reports on the Chinese NGO scene. 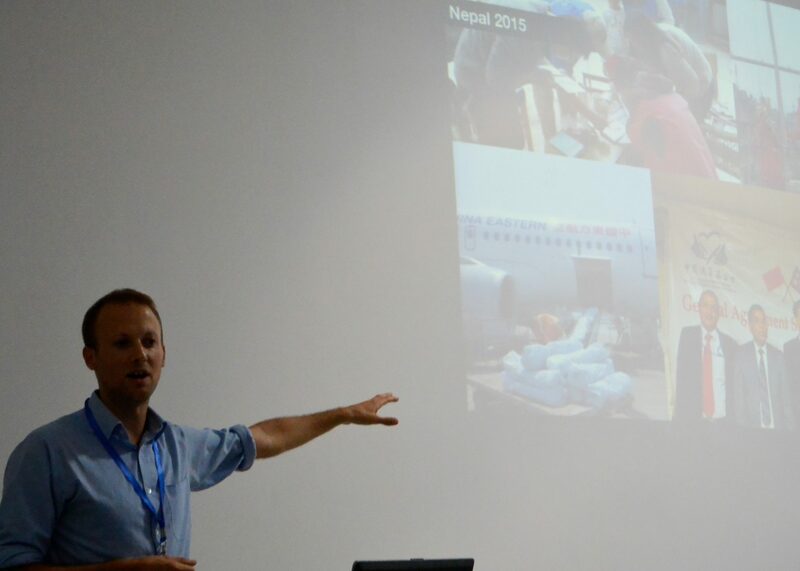 Following the level of involvement of Chinese NGOs in disaster relief from the 2008 Sichuan earthquake to the earthquake in Nepal in 2015, he showed that Chinese NGOs have expanded their technological capabilities and expertise, as well as their international action scope. Still being on the receiving end at the time of the Sichuan earthquake, Chinese NGOs themselves are now sending disaster relief teams to disaster locations around the world. Zhou Xufeng from the China Social Enterprise and Social Investment Forum completed the topic of China’s civil society development with an input on social enterprises and their contribution to social innovation. According to Mr. Zhou, in recent years there haves been a large number of social enterprises emerging in China, a parallel trend to the emergence of more and more NGOs. He defined Chines social enterprises as firms (whether profit or non-profit) that see solving social issues and creating social value— rather than maximizing profit—as their priority. 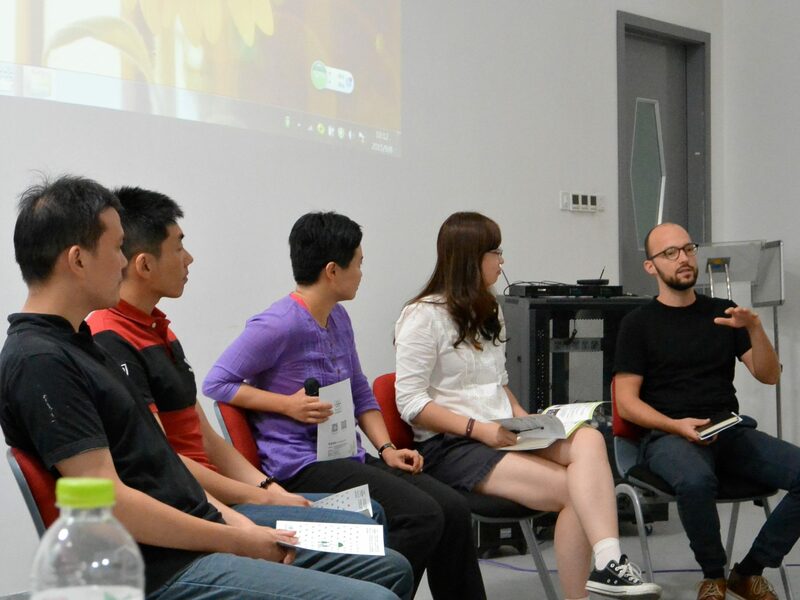 At the Boao Forum on Hainan in October 2015 there were many young people who originated from the countryside and decided to go back and start a social enterprise. He presented many model cases which received moral support by Premier Li Keqiang. But at present, China has no formal policy document laws, regulations regarding social enterprises, and no clear definition or categorization. This has led to prejudices and mismanagement among entrepreneurs, but also within the perception of the public. His association-like network hopes to boost the development of social enterprises and social investment industry in China, by providing services and training to social entrepreneurs. According to Mr. Zhou, in five to ten years most of the Chinese enterprises should have become sustainable enterprises. Moreover, his network is currently working on a certification for social enterprises. One of the European twinners wanted to know the benefits of getting a certificate. Mr. Zhou answered that governmental support would be provided to certified enterprises. Also, investment banks and the young rich investors are eager to put their money into something meaningful, therefore they trust more in Social enterprise which had been certified. Mr. Zhou also introduced one successful example of social enterprises in China: Fast Fish is a clothing line that fosters rural girls education and train them to become middle level managers. It employs rural girls who have dropped out of school as designers, artists, and factory workers. It offers its workers opportunities for promotion, high wages, and strong networks in the industry. Delving more into environmental protection details, Mr. Xin Hao from the local host organization Green Zhejiang introduced Chinese NGO’s approach to utilize internet technology for environment pollution monitoring. Most environmental pollution data in China has to be publicly available by law. However, polluting industries and local environmental protection bureaus are reluctant to follow these rules. Also, the mere data is hardly comprehensible to ordinary citizens. Chinese NGOs in recent years have started to engage affected netizens for a kind of crowdsourced reporting on local pollution, by developing special smartphone apps. NGOs collect and analyze environmental data and communicate them back to affected communities and the broader public, also via web-based means, such as messaging apps. The data is also visualized through internet pollution maps, and therefore easily comprehensible. Copying the very successful method of the Green Choice Alliance and the NGO IPE Green Zhejiang also relies on the support of the responsible public entities whose feedback is circulated via the internet. Although Environmental protection bureaus often have their own reporting hotlines or Wechat accounts, they seldom have enough staff to record all pollution indications or respond to them. Moreover, the public is more likely to report to NGOs, as they are perceived more trustworthy and enganged with the topic. NGOs then communicate reports to public entities with which they have established working relations. This has proved a lot more efficient than single citizens direct reports to EPBs. 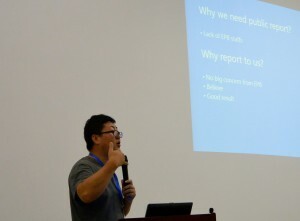 Xin Hao demonstrated that the Chinese bureaucracy lead to an ignorant environmental policy. Taking the Qiantang river in Hangzhou as an example: 9 “dragons” (officials) from water bureau to river administration are involved in the management of the river. Therefore, nobody really knows to whom they should send reports and in the administration nobody takes responsibility. 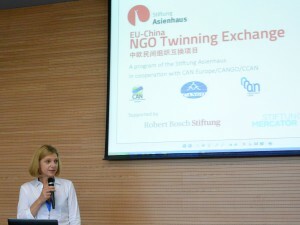 Regarding mobilizing the people, Green Zhejiang also learns a lot from foreign partners in Europe and especially the US. They adapted the idea of the “International swimming day” and changed it to the “swimming week”. During that week, 2000 volunteers swam in the river to promote clean rivers. 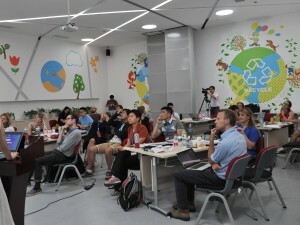 Li Haishi introduced the work of the Woodpecker Food Safety Center (WFSC), the first non-profit organization solely focussing on food safety in China (there are many ither NGOs in China who deal with food safety among other topics). Established only in 2013, the organization focuses on the manifold food security related problems in China. A growing number of food scandals gone-public have put food safety on the second important spot of Chinese citizens concerns. During the past 2 years, the WFSC has conducted safety inspection into foodstuffs, published more than 30 papers on their results and done widespread public education and media work on healthy nourishment. One of the opportunities to apply their findings of badly performing food enterprises is a smart phone app, that when scanning the QR code of the food product leads consumers to WFSC’s website and a ranking of the food safety performance of the producer. But they also provide quality control services for the agricultural marketing enterprises, in order to improve the quality of agricultural products. 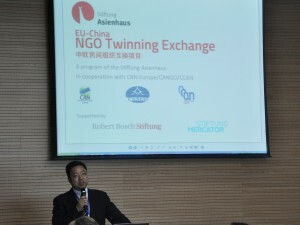 Following the inputs of the different NGOs on the topics of the 2015 participating organizations the twinners had the opportunity to listen to alumni reports, to present their work and their plans to build sustainable partnerships. 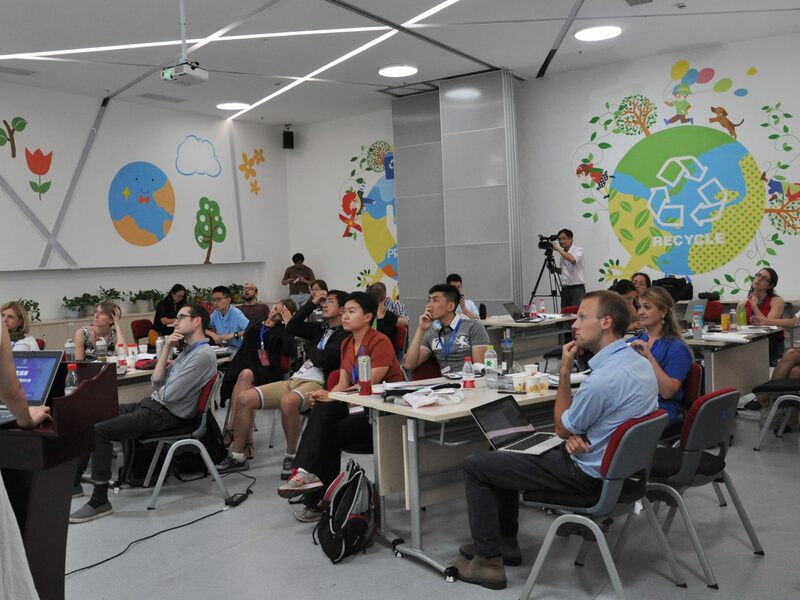 Ms Yu Yin, who organized the seminar, moderated one roundtable on food safety, and three peer sharing sessions on waste management, environmental education as well as ocean and air protection. 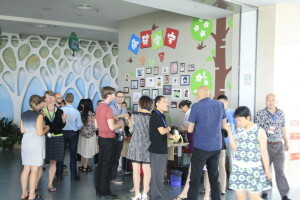 The program was completed with a guided tour through the low carbon technology museum, the conference venue. 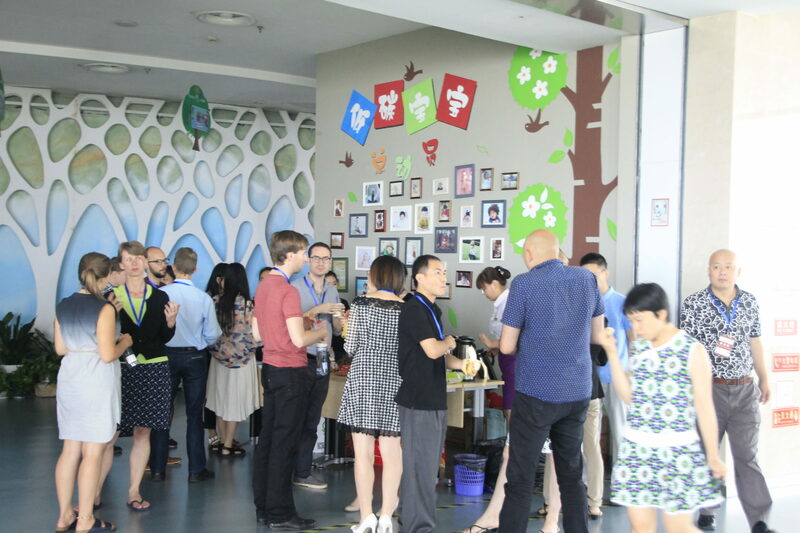 At the third day all particpants visited the Huanghu Nature Garden where different environmental and social projects were presented.